This is a touch of luxury, truly delicious, impressive, and yet very simple to do. Eat with a spoon of crème fraîche. The perfect ending to a Middle Eastern inspired meal. 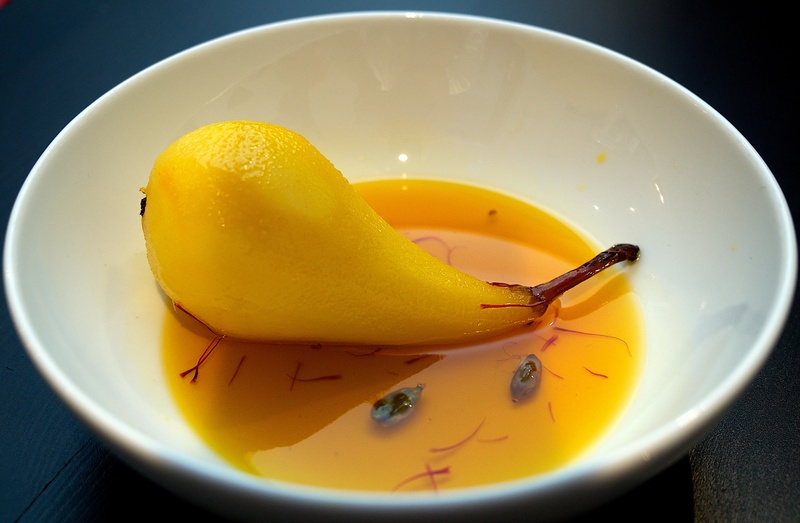 Pour the wine and lemon juice into a medium saucepan and add the sugar, cardamom, saffron and salt. Bring to a light simmer and place the pears in the liquid. Make sure the pears are immersed by adding a bit of water if necessary. Cover the surface with a disc of greaseproof paper and simmer until the pears are cooked through but not mushy, about 15-25 minutes. Turn the pears around every now and again as they cook. When a knife goes into the flesh smoothly, the pears are done. Remove from the liquid and transfer into four dishes. Increase the heat and reduce the liquid by about two-thirds, or until thick and syrupy. Pour over the pears and leave to cool. Serve cold or at room temperature with the crème fraîche.